Just looking at a sunflower, we can tell that the sunflower was carefully designed by a wise Creator. Math, however, allows us to see God’s design to a new level, revealing the care God took with each aspect of His creation. The seeds in all sunflowers—be they large or small—are arranged according to two patterns. 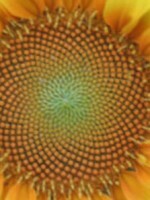 When we use math to examine these patterns, we observe that, no matter how many seeds the sunflower contains, the patterns always relate to each other according to the exact same mathematical proportion. It turns out that that precise proportion enables the most amount of seeds to fit in any given sunflower. What a wise, caring Creator we serve! Learn more about math, sunflowers, and the Fibonacci numbers/the Golden Ratio. Learn more about how math can be viewed and taught from a biblical worldview.